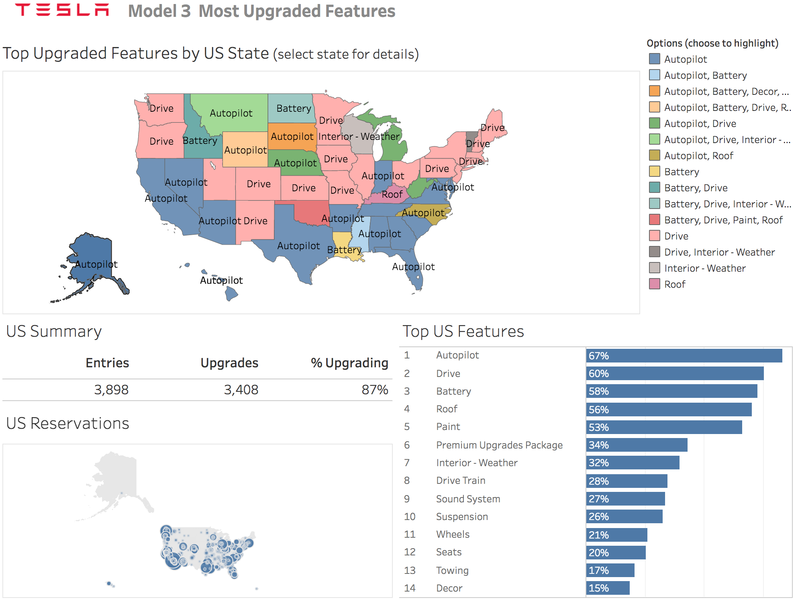 Ben Sullins from the Youtube channel Teslanomics – the same who brought us the new travel tool for Supercharger costs – build a new interesting data visualization tool about Tesla. This time it’s about demand for likely options on the Tesla Model 3. Unsurprisingly, the Autopilot is most popular option among reservation holders and maybe a little more surprising, a majority of Tesla Model 3 reservations holders in the US want a battery upgrade over the base “more than 215 miles” option. Tesla CEO Elon Musk has already confirmed that they plan to offer more than one option for battery packs, but we know nothing about the price of those options, or any other options for that matter, and therefore, I would take all the following data with a grain of salt since it will change quickly when people have all the details and information about pricing. Nonetheless, it’s interesting to see what the hundred of thousands of Model 3 reservation holders are thinking in term of options for their upcoming vehicle. 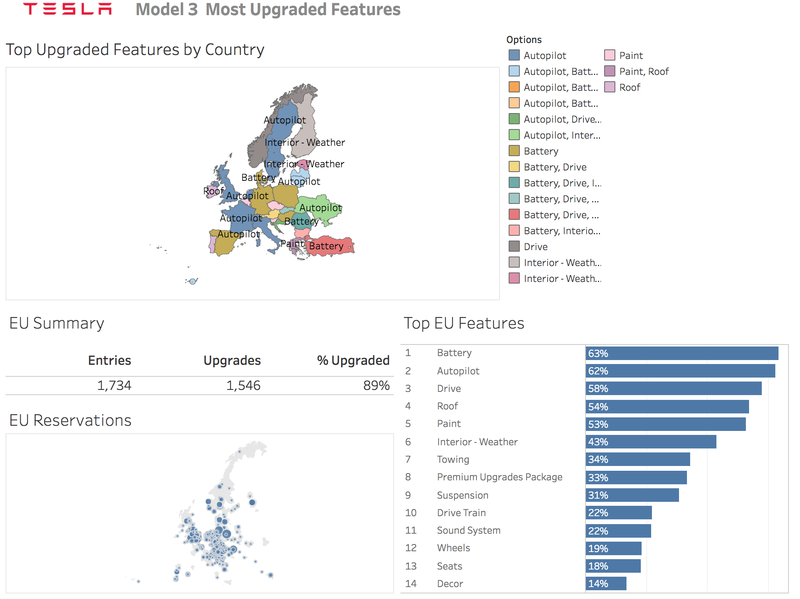 Sullins used the data from almost 4,000 Model 3reservation holders in the US surveyed at Model3Tracker.info to create his new tool with Tableau – see below – and thousands more in Canada and Europe. Here are some interesting points that he highlighted from the data. In the US, 87% of the reservation holders participating in the survey say that they want to add at least one option – meaning that only 13% plan on buying a bare Model 3 at $35,000. The most popular option is Tesla’s Autopilot, which the company has already announced will be powered by its second generation hardware suite that it believes will at some point enable fully self-driving capability. 67% of respondents said that they want the feature. It is currently offered on the Model S and X with two options: Enhanced Autopilot ($5,000) and Fully Self-driving Capability ($3,000 on top of the $5,000). It could potentially be a little cheaper for the Model 3, but it’s not likely to be by a significant margin. As previously mentioned, a battery upgrade is also a very popular option among respondents. More people actually want an upgrade than people who are OK with the base model. Again, I think that will change when people start pricing the vehicle when the configurator becomes available later this year. A battery upgrade alone is likely to be priced about $5,000 higher than the $35,000 base price. In Europe, the battery upgrade actually surpasses the Autopilot in popularity. In Canada, the all-wheel-drive option unsurprisingly takes the first place because of the weather.